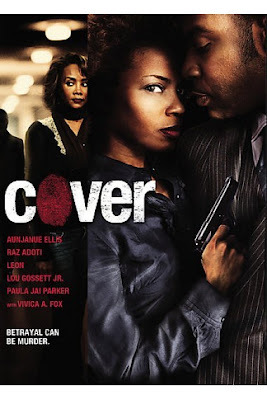 Cover by director Bill Dukes (who made A Rage in Harlem), a movie about lies, betrayal, and infidelity, promises a lot in its promotional material, but falls a little short on delivery. That said, the flick is not unworthy of your viewing time. The second half, after a plodding first half, captured my attention, and kept me watching to the very end. The plot is somewhat predictable. Valerie Haas, a black woman, is a devout churchgoer married to a psychiatrist, Dutch. Predictably, Dutch is ambivalent about churchgoing, which feeds into the stereotype of gay men who have an "issue" with religion. Dutch also has a former female fling who refuses to give up on him, or so it seems. Valerie gets jealous, as you might expect. She herself has more than one challenge on her hands. A well-known singer with a "gangster" persona and oversexed drive is hot on her heels. All those disparate parts get tied in at Valerie's weekly women's meetings (one of the women is played by R&B singer and gay icon, Patti LaBelle) at the church. A lone black gay man joins the group, and soon the movie moves in the direction of dissecting the well-known, but secretive, phenomena, the "down-low" culture of black men. The movie is at its best when it raises tough questions on down-low men. The movie acknowledges that the black community's ostracization of gay men has shaped this underground subculture, but it also places some of the burden on personal responsibility. Then Valerie is charged by an overly ambitious district attorney with the murder of that male singer--a turning point event that seems irrelevant to the marital problems that Dutch and Valerie face. But through flashbacks, we learned of how the small pieces of this puzzle fit together. And the final twist will surprise most viewers. The acting in this film is uneven. Often, the actors engage in hsyterogenic reactions. Nuanced acting is inconsistent in this film. Raz Adoti, as Dutch, however, turns in a fairly engaging performance. So does vetaran actor Lou Gossett Jr. as the sympathetic detective who interrogates Valerie. Aunjanue Ellis as Valerie, however, could have toned down her hyperbole. The movie is PG-13 (which means there there is very little skin!) and runs for about 90 minutes. Watch this film after you have watched the DL Chronicles series from HereTV, the gay cable channel. DL Chronicles is far more thoughtful and provocative than Cover. And yes, it has more skin! You can find both the film and series at your local Blockbuster and Hollywood Videos stores.